ABOVE: Casa Rezzonico (not to be confused with Ca' Rezzonico, a grand palazzo and museum nearby). INSET BELOW: The B&B's private garden. 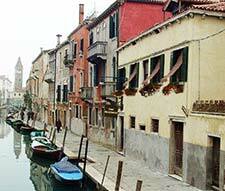 You're looking for coziness and a great location in Dorsoduro at competitive rates. The Casa Rezzonico is on the Fondamenta Gherardini, almost next door to the only remaining greengrocer's barge in Venice. The Campo Santa Margherita is just across the "Bridge of Fists" (a footbridge where rival clans of Venetians once knocked each other into the water during fistfights). The Campo San Barnaba, which has been featured in movies such as Indiana Jones and the Last Crusades and Summertime, is a few meters away from the hotel. The Casa itself is small, furnished in traditional style, and blessed with a garden courtyard where you can have breakfast in summer. The single, double, triple, and quad rooms are air-conditioned, and the rates include unlimited Wi-Fi Internet access. In the top satellite-photo map, the Casa Rezzonico is near the bottom of the frame, by the words "Peggy Guggenheim Collection." (Google's label is incorrect; the museum isn't anywhere near this location.) You can see the Piazzale Roma at top left, with the Calatrava Bridge leading to the railroad station. The Grand Canal is on the right. In the second photo, the Casa Rezzonico is across a canal from the Carmini Church (with tower, lower right), behind the incorrect "Peggy Guggenheim Collection" label. The Campo Santa Margherita is in the foreground, and the Campo San Barnaba is the grey square at left.